I am delighted to receive the endorsement of Dr. Ophelia Garmon-Brown. As Co-Chair of the Charlotte-Mecklenburg Opportunity Task Force, Ophelia understands the challenge of making sure everyone in Charlotte is offered an equal opportunity to thrive. Ophelia was the first African-American female resident at Carolinas Medical Center. She joined the Nalle Clinic and moved into leadership positions and throughout her career has consistently earned new leadership roles. She is the founder and director of a free community health clinic and she serves on the board of directors of the Mecklenburg County Medical Society. The other organizations she serves include Queens University, the Charlotte Chamber, and the Presbyterian Healthcare Foundation board. Dr. Garmon-Brown was named the 2010 Charlotte Observer Woman of the Year. She also earned the 2009 Women in Business Achievement Award from the Charlotte Business Journal, the 2011 Thurgood Marshall Award, the 2011 Lifetime Achievement Award from Wells Fargo and the Charlotte Business Journal, the 2012 Family Physician of the Year, and the 2012 Charlotte Catalyst Award. I am honored to have the endorsement of such an amazing and accomplished woman who cares about Charlotte and the people who live here as much as I do. 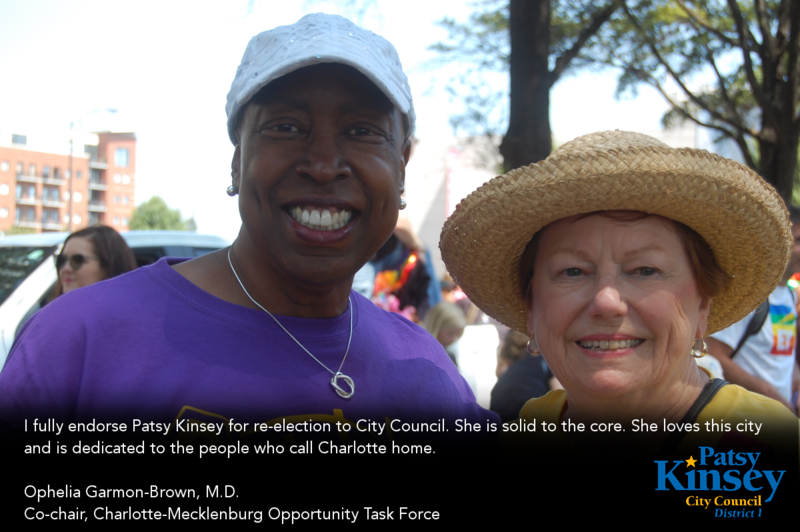 I fully endorse Patsy Kinsey for re-election to City Council. She is solid to the core. She loves this city and is dedicated to the people who call Charlotte home.